I’ve been a bit busy with my 2012 Project Harmony work, and before I knew it some days had passed without updating the blog!! Apologies for that… but I’ve made great progress recently! After revamping my desk area, I started tackling my closets, which is no small feat. But until I find a few last things to finish the closets, I’ve tabled them for now… Instead, I’ve moved on to a project that I started a while back. A couple months ago, I found a great article about saving a drab desk chair from becoming a curbside tragedy. 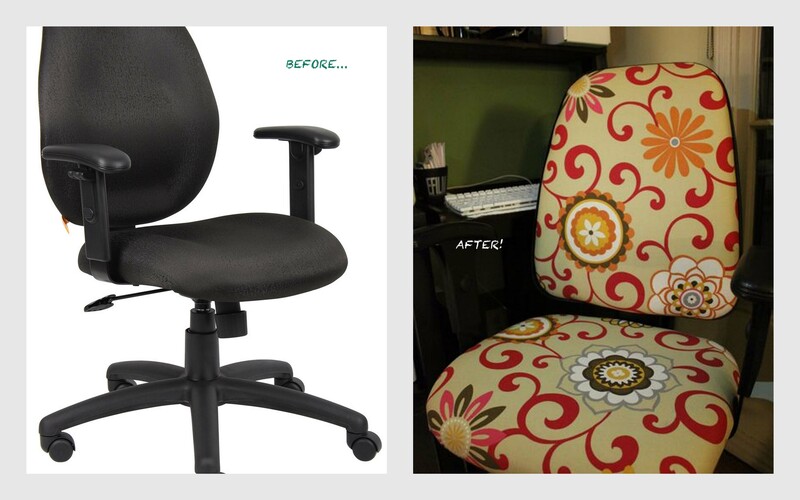 I knew I had to do something with my own horrible black boring desk chair, and so the day after Thanksgiving I found a great fabric, and this past weekend my better half and I performed minor surgery – and voila! We are sooo happy with the results!! The desk chair will also now be invited to come out when visitors are over!! 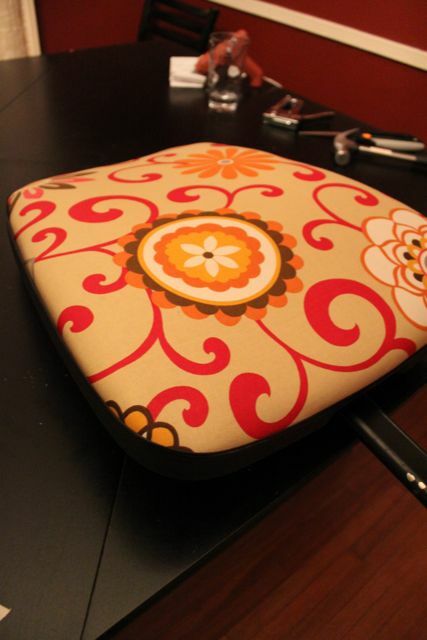 It was definitely a project that required two people, just to make sure the reupholstery fabric was taut. It was also very helpful to have a handyman to take the chair apart and put it back together afterwards. 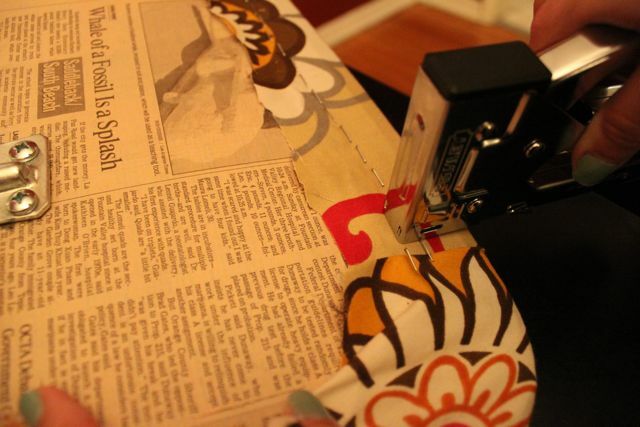 Removing the original fabric was very tedious – there were lots of staples holding it on, so removing them all was impossible. 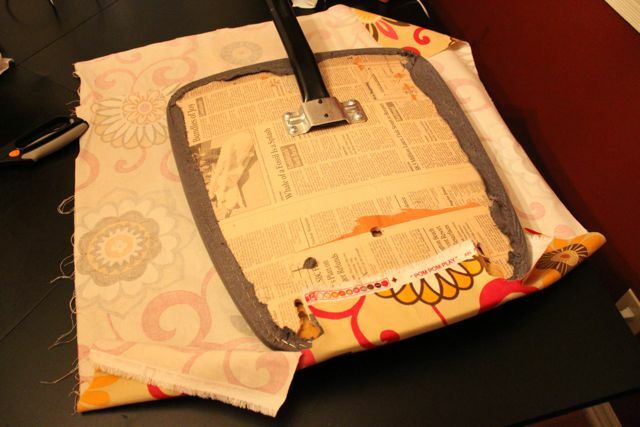 But be sure to use a canvas or upholstery fabric so that it is strong enough to handle the staples and tight pull. After we finished the project, we realized we were bitten by the reupholstery bug – we can’t wait to find our next chair needing a facelift!! Well I still have a couple weeks left in the 2012 PH, and I will have a couple more updates in the next couple of days to share with you. Until the next progress report – continue living la belle vie, my lovelies! This entry was posted in belle vie, le decor and tagged decor, DIY, home by rebeccawenstrup. Bookmark the permalink. Beautiful job on the chair. I am wanting to do the same. Would you recall how many yards of fabric you used?